It has become very necessary and important for our records, that as a former Governor, leader and contestant for the 2019 APGA gubernatorial primary elections in Imo State, I should address the people of Imo State on the monumental betrayal and injustice done to Ndi-Imo, Ndigbo and Nigeria as a whole by the national leadership of the All Progressive Grand Alliance (APGA). Let me quickly place on record that the vision of the party APGA, inspite of national pretentions, is intricately tied with Igbo nationalism, identity, vision and hopes. It was more of a spiritual than a socio-political organization; that at no time than now has APGA had a better outing than the current dispensation with the huge win recently recorded in Anambra (otherwise called 21 over 21) and the array of highly qualified and credible candidates that aspired to win the Governorship of Imo State through her. The expectation we were told by Obiano was that by May, 2019, APGA would have formed the Governments in Imo and Abia in addition to Anambra. Today this hope is dead and buried. Despite great assurances to us by the party leader Governor Willie Obiano and the National Chairman Ozonkpu Victor Oye, that the party would conduct a transparent and credible primaries for the aspirants, what we have witnessed is the worst display of dishonesty, failure, collective insult to fellow Ndi-Igbo, administrative ignorance and primitive greed. The criminality of it all can hardly be imagined by any right thinking Nigerian. This is indeed “a theft and betrayal of historic proportion” (A declaration by the association of cheated APGA Governorship Aspirants [N.APGA] on Thursday 11th October, 2018). APGA demanded the sum N4,200 from every member of the PARTY in the 305 wards of Imo state called membership update dues and over 5795 members paid. APGA charged N10,000 from each of more than two thousand members contesting for delegate positions under the auspices of various contestants for Governorships, Senate, House of Representatives, and House of Assembly. APGA foot soldiers collected all sorts of bribes for clearance of aspirants. In all APGA National Leaders fleeced about N2.8b from Imo State alone. In addition to abhorable abuse of many female aspirants in our own hotels and yet denied them tickets. The party failed to conduct even one delegate election in all of the 305 wards of the state. It could not even raise a panel to do same or spend a dime on the logistics of conducting the delegate elections. The result was that the party could not raise any credible list of delegates for the primaries scheduled to hold from the 2nd October, 2018 beginning with the House of Reps. Until the date of the last deception, there was no approved and published list of delegates from either the state or national office of APGA. For three consecutive days namely Friday 5th, Saturday 6th and Sunday 7th October, 2018 the party shifted the governorship primaries keeping delegates including pregnant women and nursing mothers for up to 10pm each day with all the governorship aspirants and “their own delegates” (some over 500 party possible delegates from various LGA for each aspirant), with the attendant logistic costs of transporting and feeding them for the three days, waiting and hoping it would hold. At the end of all these charade the party still failed to hold any primary election in Imo State. By this failure, APGA has violated the basic agreements between party and members and breached the contract to organize and hold primary elections for all her aspirants who worked and paid money for same. To me the news that the All Progressives Grand Alliance (APGA) now has a candidate for the 2019 gubernatorial election in Imo State is laughable, childish and baseless. The story that one of the aspirants took his fans and went to an unapproved venue (the Nwankwo Kano Centre) and held party primaries for himself alone is criminal and does not make sense. Does it make sense to think that you can hold a party primary election by 12 midnight in an unapproved venue without other aspirants; without the state and local government Executive of the party; without any statutory delegates; without INEC representatives; without DSS and Police; and without the popular Imo State press? Doesn’t it rather sound silly for anyone to believe that you can obtain value from such pretence? Burying her head in the sound has never secured the life of the ostrich from hunters. It is on record that the state working committee of APGA in a meet on Sunday 7th October fully covered by the print and electronic media declared that the primary elections did not hold. Where then is the basis of the declaration by the National working committee that a candidate emerged? How can we have a winner without a contest or a consensus? That can only obtain in a lawless society. 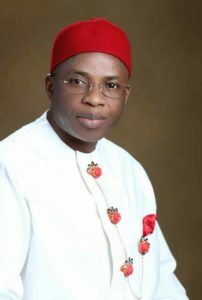 I must put it on record here to Ndi-Igbo everywhere, that what Governor Obiano, Victor Oye and rest of their gang has done to us in Imo State is an insult to me Ikedi Ohakim; to all the other 250 aspirants that contested under APGA for Governor, Senate, House of Reps and House of Assembly; to the entire State and Local Government Executives of APGA, in Imo State; to all the statutory and ad-hoc delegates who were all fleeced and tortured for three days by the devious maneuvering of Obiano, Victor Oye and their criminal foot soldiers:- To the ordinary party members who were denied their right to vote for delegates and their preferred aspirants as well as denied their right to political education and participation which is a primary function of all political parties. The APGA members who were defrauded and their rights criminally violated are the traders that stand in the rain and sun to sell their wares on daily basis. They are the farmers, artisans and our jobless youths. They are our church members whom we preach to on daily basis to be law abiding and fear God. But right before us they have been defrauded and their rights violated and abandoned, like sheep without shepherd. This is the time for every Imo person, every Igbo person, every traditional leader, political leaders and religious leaders across Igbo land to rise up and save the Igbo Nation from the assault on our collective psyche and integrity. It is therefore in the best interest of all Christians across the globe and Igbo land in particular that Christians and Christian leaders in our land should rise up and condemn this day light robbery and of course distance themselves from APGA and the beneficiaries of this monumental fraud. This whole act is an intentional insult and injury to Ndi-Imo in particular as well as an abuse of the respect we have for Anambra State and Ndi-Anambra as brothers (and by the grace of God) as a leading community of the Igbo race, leading in the Church, in education, in politics, in business etc. This is one insult too many. Let this abuse and taking for granted, not continue. Our unity in Igbo land is so important to our survival and development as a people and a nation. It is indeed too shameful that these disrespectful fraudsters extended their callousness to the handling of the case of the widow of our immortal leader Dim Chukwuemeka Odimegwu Ojukwu and the daughter of an equally illustrious Igbo leader Chief C.C. Onoh (ani nefu ngwu). Our grievances here in Imo State is perhaps ameliorated by the fact that this criminality was meted out not only to us, but also to Ambassador Bianca Ojukwu and several illustrious Anambra sons who aspired for office under APGA. Let me assure Ndi Imo that the this APGA day light rubbery in Imo will not go unchallenged even if it will take us to the Supreme Court and all courts of public opinion. I would like to appeal to INEC and the security agencies not to succumb to any pressure to support this robbery and massive corruption bearing in mind that our amiable President abhors corruption in its entirety. I think it is time to face the fact that the All Progressive Grand Alliance (APGA) has failed and must die. The betrayal we see today has always been part and parcel of the history of APGA. Chief Chekwas Okorie, late Dim Chukwuemeka Odimegwu (Eze Igbo) Prince Arthur Eze( Ozo Igbo Ndu) and many stake holders who were critical to the founding of this party were all betrayed. Both Governor Obiano and Governor Rochas Okorocha who rode to power on the back of APGA and Governors in this season of anomie are agents of monumental betrayal of Ndi-Igbo. Fifteen years since it began to vie and to achieve power APGA has not been able to conduct any credible election primaries inspite of all the vaunted knowledge and wisdom of our people; Not for Peter Obi; not for Obiano; not for Rochas etc APGA has consistently been incapable of conducting ordinary party primaries since its inception. Fifteen years, APGA is still bereft of any leadership capacity to lead Ndi-Igbo in an Igbo wide, nay Nigeria wide, political discussion.Fifteen years, APGA has grown as a party neck deep in corruption and confusion of unimaginable proportions; a party that lack structural cohesion whose officials are neither trained nor cultured. APGA had become a trading port with a group of unconscionable gangsters strutting as leaders and extorting money from other Igbo states. It does not make any sense to think of a revival of APGA. Governor Obiano should be the last Governor of APGA. Of course his foot soldiers from Awka and Aguleri know that the party will die with him and were therefore falling on each other defrauding our people and making frenetic efforts to get their last share of Imo Money. We are now fully convinced that APGA had never intended to win elections outside Anambra state and therefore remained a vehicle for internal neo-colonial exploitation of innocent brothers. I think it is time for Ndi-Igbo from all Igboland within the South East and beyond, to start discussing about a new political platform with which to engage the rest of Nigeria. We need a credible platform to discuss the restructuring of Nigeria which is now before us. We need the kind of leadership that (as Achebe would advise) would rise to the responsibility of leadership and to the need for personal example which are the hallmark of true leadership. Unfortunately, Obiano and his agents do not have these qualities and APGA is now a tainted platform for noble aspirations. Imo state today lies prostrate from seven and half years of mis-governance originally promoted by APGA. I had joined the APGA, hoping that her managers would see the fatal error of bringing Okorocha in 2011 and work with me to redress the disaster they have created in Imo. We did not join APGA without a commitment from the leadership both at state and national levels. We were promised that there would be no imposition of candidates at all levels. We were promised that there would be credible and transparent primaries to elect the party’s flag bearers for different offices. We believed them and invested our time and resources in building a pan Nigerian party, believing that the leadership of the party would live up to their promises of conducting credible and transparent primary elections for all the aspirants. We accepted numerous apologies and regrets from key party leaders on the use of the party by some federal forces to install Okorocha and destroy the Imo Charter of Equity. We believed them and worked very hard and prepared for the primary elections. And for the very first time APGA had about 5,795 people willing to stand for delegates election to emerge as delegates to vote for their preferred candidates. Unfortunately the leadership of APGA saw the increasing membership as an opportunity to defraud our people. They rather preferred to add salt to our injury. APGA was like 100 capacity KVA transformer, injected with 500 KVA power (membership) source, it exploded, caught fire and burnt to ashes. Ndi-Imo nwem, we must walk past this calamity. I am not unaware that the majority of Ndi Imo want Ikedi Ohakim back and that was why they followed me to APGA. The truth is that if the constitution had provided for independent candidacy I could have run as an independent candidate. As former Governor I am equipped with the cognate experience for the job of the Governor, especially the job that would be done post Rochas. I handed over to Governor Okorocha and I know what I handed over to him. I am the only person that has a float of relevant files and can quickly rebuild the bureaucracy and other institutions of governance. Moreover, I have only one term. Therefore, the present chaos in the state and the succession quagmire requires only experienced and clear headed leadership to address. I have bound myself with an Oath to recover Imo State from an avalanche of failures; a failure of the public bureaucracy; a failure of the state to service her obligations to her workers, serving and retired; a failure of the Local Government Services; a failure of the statutory commissions; a failure and abuse of the State House of Assembly; of the State Judiciary; of our educational system; a failure of our water and road infrastructures and a near collapse of the Pillars of the economy, namely the markets, the artisans, the contractors etc. We have carefully studied our situation and decided that the best option for our state is to secure for the 2019 elections a vehicle that is not under the control of any external or internal buccaneers, inorder to provide an independent and self reliant leadership that cannot be easily sabotaged by anyone. Those other aspirants who have been robbed, we assure you of a credible platform to offer yourselves to the electorates and that the up-coming election will be based on whom you are and not necessarily which platform you ascribe to. Working with like minds, we will enter into a new accord with Ndi Imo with our 4 cardinal point agenda of RECONSTRUCTION, REHABILITATION, RECONCILIATION and RECOVERY in addition to the total implementation of the contents of my covenant affidavit with Ndi Imo. I am more than pleased to announce to Ndi Imo that God Almighty in his infinite mercy has provided us a credible alternative Party-ACCORD. ACCORD, fortunately is the number one party in the ballot paper for 2019 election. ACCORD believes in oneness and progress; what Ndi-Igbo want in Nigeria is ONENESS in Nigeria that will allow for our PROGRESS as a people. ACCORD will be the key to discuss the Igbo future in Nigeria. We will all laugh last. Like Nehemiah in the bible, our soldiers must have one hand on our swords and the other hand on our working implements. While we seek redress with APGA, “let us ‘RISE and REBUILD Imo’ (Neh 2:18)” and return her into the hands of God.